A single AA or AAA battery would be an ideal low-cost power source for a small AVR-based project, but unfortunately they only provide 1.2 to 1.5V, and even the low-voltage versions of the AVR chips need at least a 1.8V supply. The solution is to use a simple voltage-doubler circuit to step up the voltage. The voltage doubler uses an oscillator to charge up two capacitors through diodes. The voltages across the capacitors are effectively put in series, creating double the supply voltage. 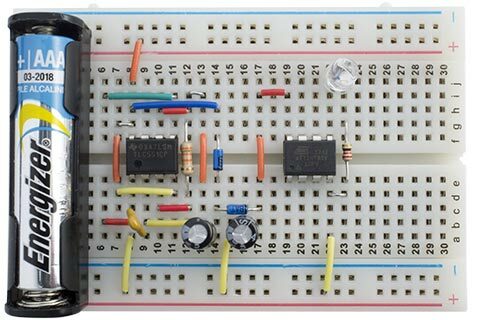 Although you can build a voltage-doubler circuit using four bipolar transistors , the simplest way is to use a 555 timer. 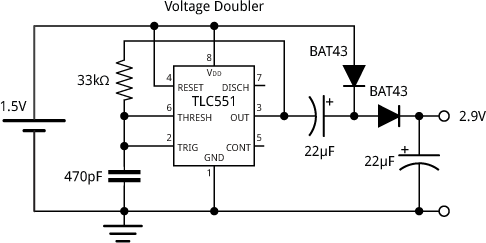 Unfortunately most 555 timers require a supply voltage of at least 2V; fortunately Texas Instruments have made the TLC551 which is functionally identical to the 555, but it can operate with a supply voltage as low as 1V. The 551 is wired as an astable, which generates a square wave on the OUT pin of about 40kHz. The output is then fed through a voltage-doubler circuit, consisting of two diodes and two capacitors. The circuit uses BAT43 Schottky diodes, as these have a small forward voltage drop of only 0.33V. Voltage doubler based on a 551 Timer. The output voltage depends on the current consumption, but the circuit can provide up to 1mA before the voltage drops below 1.8V, which is adequate for a low-power AVR project. To test the voltage doubler I built a simple circuit based on an ATtiny85V, the 1.8V version of the ATtiny85, using its internal clock running at 1MHz. I uploaded a program that flashed a red LED connected to I/O pin 0 for 5msec every 2 seconds. Based on the average current consumption this circuit should keep running for over a year on a single AAA battery. Voltage doubler allows an ATtiny85V to be powered from a single AAA battery. This voltage doubler circuit will allow you to power any of the low-voltage AVR chips from a single 1.5V battery. When ordering an AVR chip check the datasheet to make sure you're getting the low-voltage version, 1.8 – 5.5V, rather than the standard version, 2.7 – 5.5V, because Atmel's labelling scheme doesn't make it easy to deduce this from the part number. Some of the processors are available in two versions: a standard version with no suffix, and a low-voltage version with a 'V' suffix; for example, ATtiny85 and ATtiny85V, ATtiny84 and ATtiny84V, or ATtiny2313 and ATtiny2313V. Then Atmel released reduced power consumption versions of some parts with an 'A' suffix, which cover the whole voltage range, 1.8 – 5.5V, in a single part; for example, the ATtiny84A, ATtiny2313A, and ATtiny861A. There's no 'A' version of the ATtiny85 yet. Finally, to add confusion, some of the newer parts cover the whole voltage range even though they don't have an 'A' suffix: for example, the ATtiny4313, ATmega328, and ATmega328P.